I finished Empty Nets this week. To do the pattern justice, especially in view of the fact that the time and talent for this pattern was donated by Sonya Newstead to the Sustain the Sea initiative, I decided we needed to take a trip to the beach. I picked the young man up after school and we drove to the Lake Ferry beach in South Wairarapa, which we haven’t been to before. It is a rugged piece of beach. Not really a swimming beach, but very beautiful and scenic. On one side, Lake Onoke drains into Palliser Bay. On the other side, is Palliser Bay. It was a nice place to take photos. The water was too cold for swimming, and the beach is not very safe for this activity, so the boy and I had wave races and dared each other to get our legs wet by the icy water! On to Empty Nets – here it is, in its full glory! I’m very proud of this picture, because it was taken by the youngest child. I think his photography skills are coming along nicely! 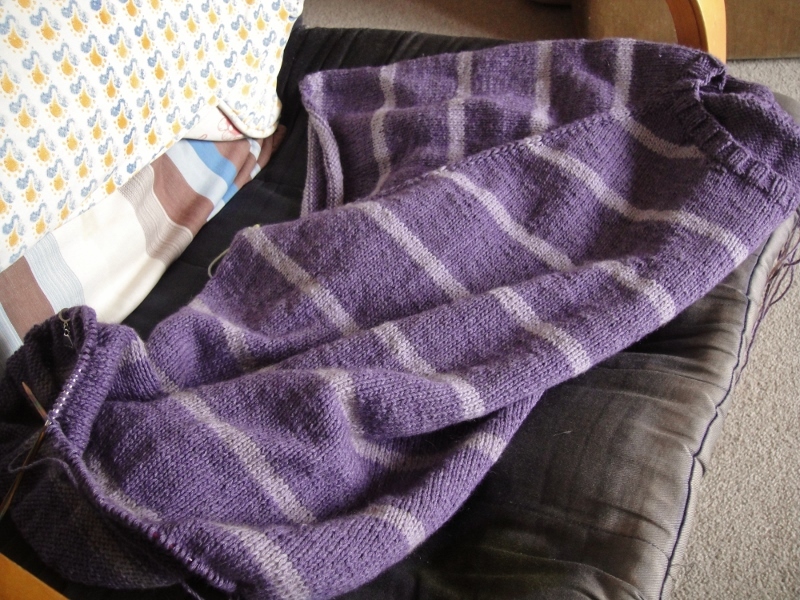 I decided I wanted the shawl to be bigger than designed, so I knitted 20 repeats instead of 17. I adore the wave edgings. The final edge is bound off using a ruffle, to represent the waves breaking on the beach. I kept mine small and did not work the second set of increases. It’s a funny shawl to knit because you think it cannot possibly become a triangle while knitting it – it looks like a slice of pizza! When finished and blocked though, it magically transforms! My notes are here if you want to know more details. 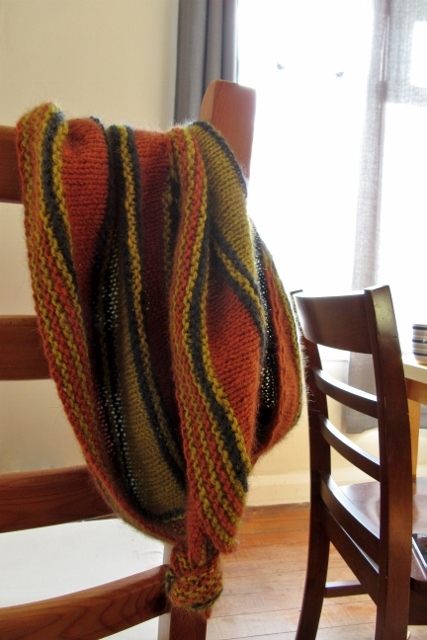 Words cannot express my gratitude to Sonya for donating this shawl pattern. I cherish the feeling of comfort that there are many people who do care about the planet and keeping life on it sustainable for future generations, as evidenced by so many of your comments while writing about this subject. I think that if more people thought about contributing meaningfully to this life, and considered the impact of their actions on the environment around them (social and physical) the world would be in a much better place than it is today. Let’s all keep on trying! Categories: Finished Objects, lace, shawls, Sustain the Sea | Tags: FO, Knitting, lace, shawl, Sustain the Sea, Wool, Zealana | Permalink. Last week, a little package of sock yarn delight arrived in the mail courtesy of Zealana. It made me extremely happy. My fellow knitters, I am excited to introduce COZI, Zealana’s first sock yarn! 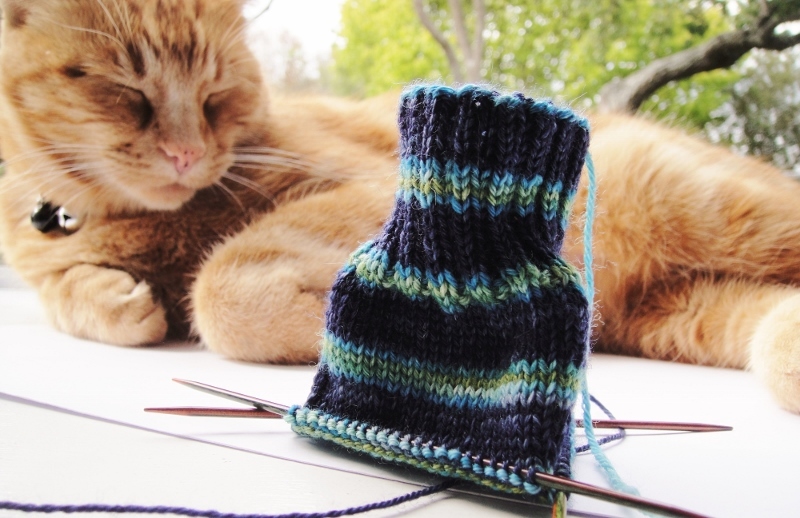 Cozi has been anxiously anticipated by me for what seems like at least a year, ever since I heard a little whisper that there was going to be a Zealana sock yarn. The wait has been torturous!! I am not sure the yarn lasted an hour after arriving in my house before it was doing its thing on my eager needles! Cozi is every bit as lovely as I hoped it would be. Zealana’s aim is to make amazing yarn, and they have done it again with Cozi, producing one of the most interesting sock yarns to enter the market this year! Let’s have a closer look to see why! Cozi is made from 58% merino, 15% New Zealand brushtail possum down, 5% baby alpaca and 22% nylon (2% of that is elastic nylon). This creates a yarn that feels luxuriously special, is very soft and yet durable. The yarn had me smiling all over from the moment I cast on. It is a beautifully plump, cohesive strand, with the most surprising spring and just the right amount of ‘squish’ factor. Knitting with it, you quickly develop a smooth rhythm and even tension as the yarn slides easily over the needles and sits nicely in hand. The tight twist and finely balanced combination of fibres has created a smooth strand that holds together very well. I am very good at splitting yarn whilst knitting, yet I experienced only one incident of a strand not making it onto the loop with its siblings – a record for me, and a testament to the good construction of Cozi. There is also no shedding of fibre as you knit. 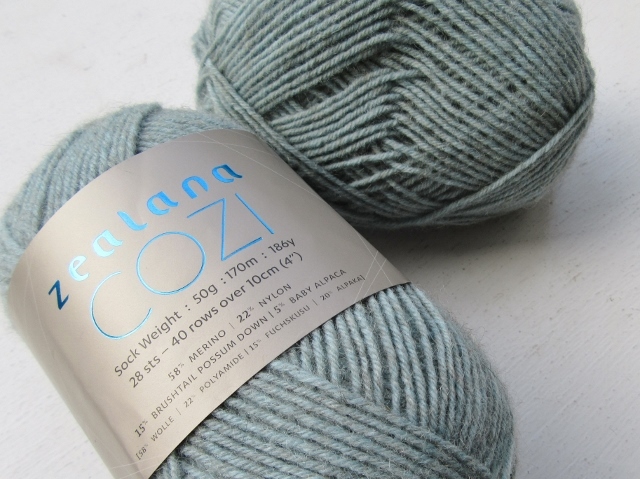 All Zealana yarns are constructed thoughtfully, and Cozi is no exception. 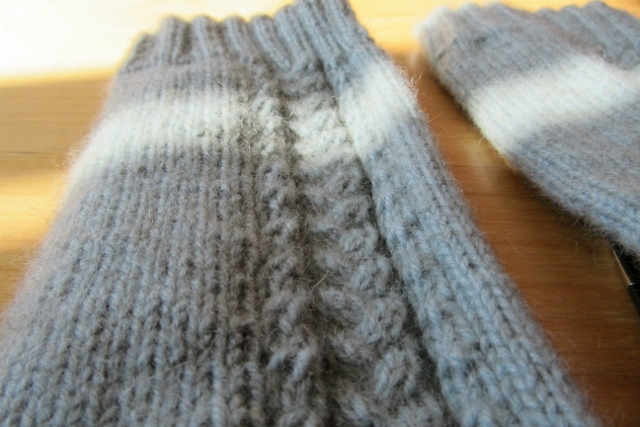 If you have knitted with a possum sock yarn before, you are likely to have found it lacks much spring. Cozi is different. It is delightfully springy! Jimad Khan, Marketing Manager at Zealana, tells me that using Zealana’s unique finishing technique, the 4 ply yarn was semi-felted around an ultra-fine texturised nylon filament (elastic nylon). This elastic nylon amplifies the spring from the twist by adding extra recovery to the fabric. Add to this the qualities of possum down (softness and warmth and reduction of pilling) merino wool (body, spring and all of wool’s wonderful properties), baby alpaca (more softness and warmth) and nylon (for strength), and you get a super cushiony fabric which is soft, warm, light, comfortable to wear and adorably hugable – all trademark qualities of Zealana yarns. 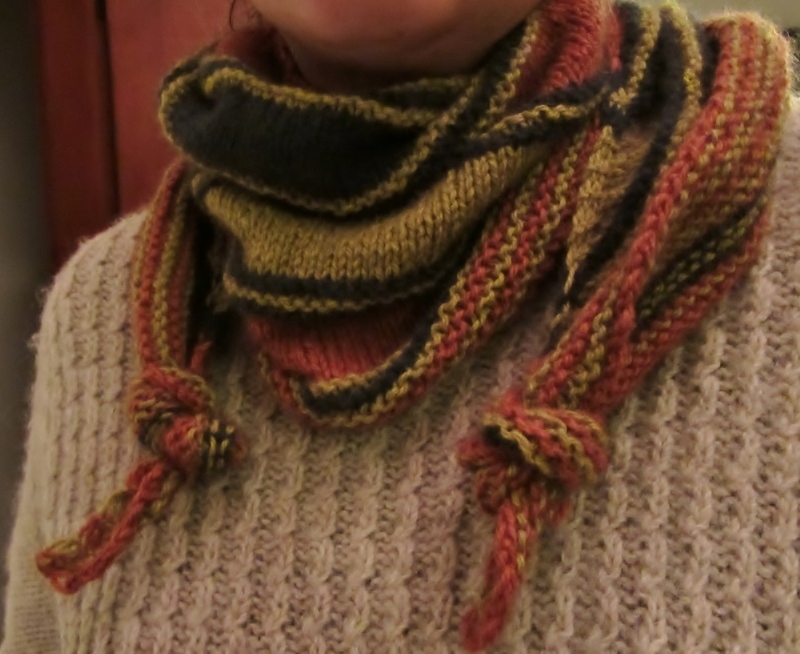 Close-up of the high twist in Cozi. I was initially concerned that the high nylon content would impact the feel of the yarn. I’m not a fan of yarns where you can feel that nylon squeak. My fears were at once pacified when I got hold of the yarn. None of the beautiful feel of natural wool, alpaca and possum has been compromised at all. I was very interested to see that the merino wool used in this yarn has not been superwash treated. This aspect has also contributed to the spring and body in Cozi because the merino wool has lost none of its super springy characteristics. I also like the implied environmental benefits of not using strong chemicals to treat the wool. Jimad also told me that a higher micron merino wool was used, which should make it a more robust yarn. The benefit gained in fabric texture and overall sock durability as a result far outweighs the traditional expectation of machine washability. Given the nylon content, it is not likely that this yarn will shrink easily. I am a reasonably careless washer of my hand knits and wash my possum garments (none of which are technically machine washable) on the handwash cycle using cold water. They always come out without mishap. The same will apply to garments in this yarn. Cozi has been made heavier (meaning, fatter) than most sock yarns. At its recommended 28 sts/40 rows over 10cm/4 inches, (7 sts to 2.5cm/one inch) it sits on the outer edge of a typical sock yarn gauge. Experienced socks knitters will recall that the standard sock gauge is usually closer to 32 sts/48 rows over 10cm/4 inches (8 sts to 2.5cm/one inch). The heavier weight of the yarn has also influenced the meterage: each 50g ball has only 170m (186y). 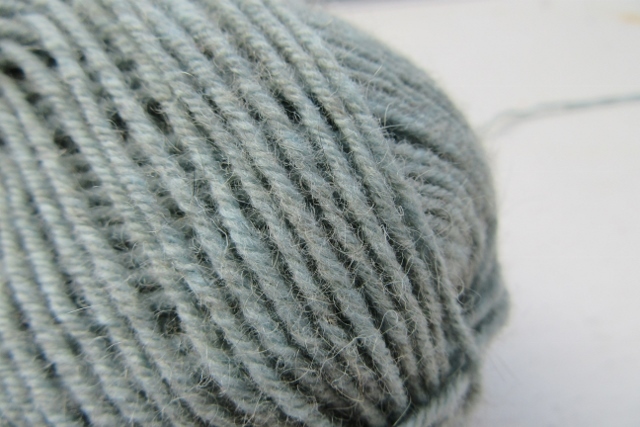 Many sock yarns are closer to 180m (200y) and above per 50g. With 22% nylon and 15% possum down (both very light fibres) in the mix, you would expect more yardage in the ball – obviously, the extra weight has gone into a bulkier strand. Because Cozi is a sock yarn on the heavier end of the spectrum, I strongly recommend experimenting with 2.5mm to 2.75mm needles when you first knit with this yarn to avoid extreme discomfort when knitting. 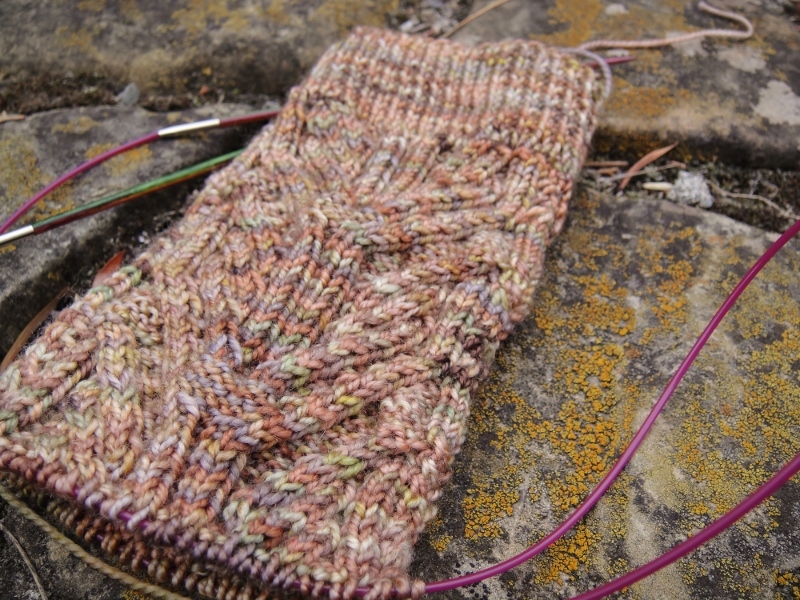 My own sock in Cozi is knitting at 32 sts over 10cm (8 sts to one inch) using 2.5mm needles, which I find is creating a very dense fabric and sits on the outer edge of my knitting comfort tolerance. Even though the yarn itself may be comfortable to knit, if you create a fabric where the gauge is too tight, this can be very uncomfortable to knit as it becomes a struggle to manipulate the needles correctly. 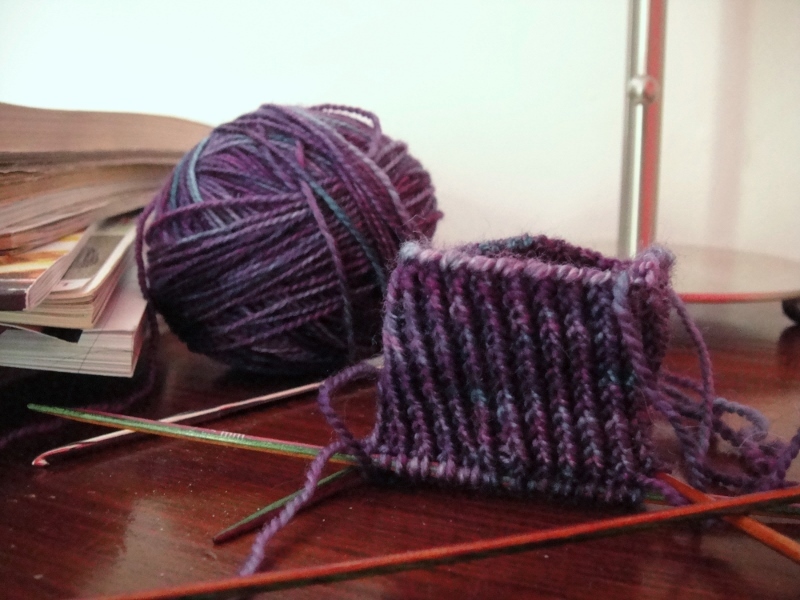 I am surprised that despite using a larger needle than recommended, my gauge is still smaller than the indicated gauge, but this should mean that you will be able to get reasonably good results with most sock patterns that call for a yarn with average sock weight. Zealana’s website recommendation for this yarn of 2.25 – 3.25mm is a good indicator of needle size range. The possum fibre in this yarn does not make itself fully known until after you start knitting, and creates just the gentlest haze over the fabric surface. Zealana has cleverly used possum down in this yarn, the same possum down as used in their very coveted AIR range. It creates a yarn with a very fine halo that is barely noticeable yet feels wonderfully soft to brush your fingers over it. You never know how much a possum yarn will bloom until you wash it though. 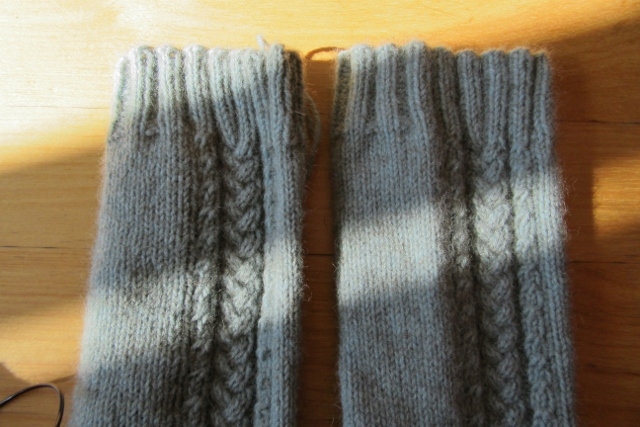 Here is a comparison between a sock that has been soaked in warm water and a not-yet-washed sock. In reality, there is not much visual difference at all, apart from the washed sock (on the right) looking more ‘finished’ than the unwashed sock. However, wet blocking (ie. 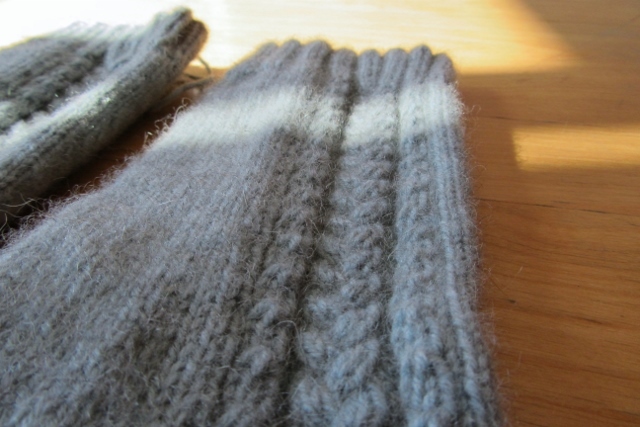 washing) has brought the possum down to the surface, and the gentlest soft-focus haze covers the knitting. My stitches have also evened out nicely. I decided to tempt fate and used warm water to soak this sock (the ball band recommends cold washing). It has not affected size at all. However, if you were to put your socks in the handwash cycle of a machine, I would recommend sticking to the cold wash recommendation. Cozi produces superb stitch definition and would suit any pattern that uses gansey-style stitch patterning, knit/purl combinations or cables. You could get a lace pattern with reasonable amounts of stockinette to work but I’d be cautious about using it for anything too intricate. 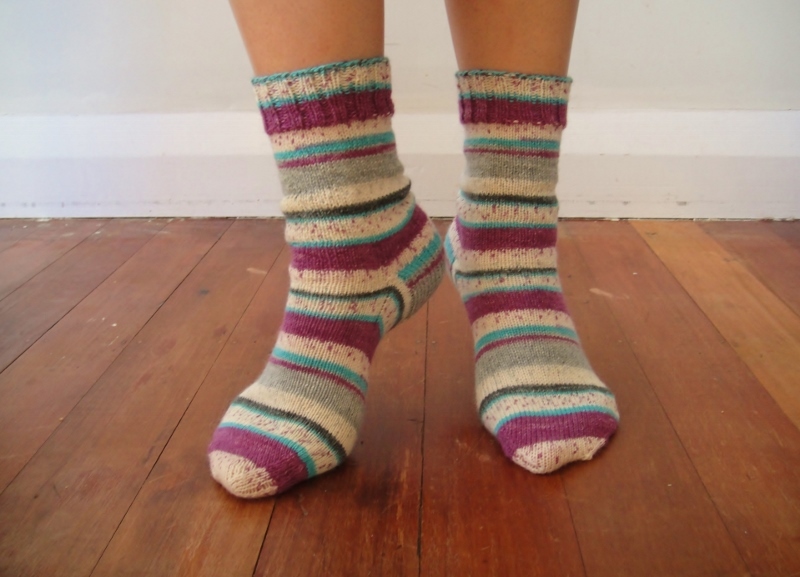 Cozi was so compulsive to knit that I finished one sock in a weekend. Slipping it on, I discovered another little secret to the elasticated yarn: it creates a sock that really hugs your foot! It felt like a warm, gentle embrace and most definitely cosy! I did not want to take it off! Although designed specifically for socks, the yarn’s great stretch recovery means that it would make amazingly cosy gloves and hats as well, and I can even imagine stretchy baby garments in this yarn. 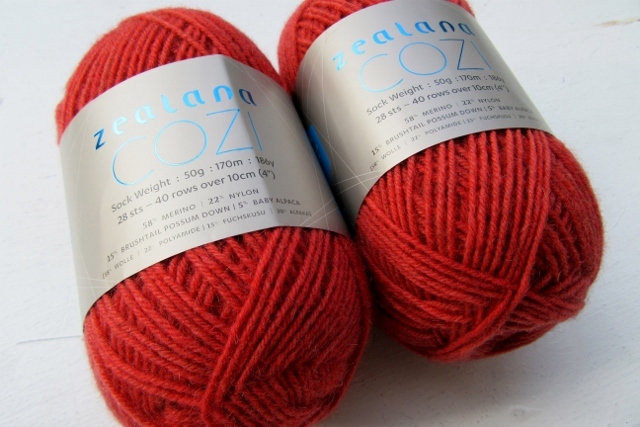 Sitting in Zealana’s cost-effective Artisan range, Cozi retails at NZ$14.50 a ball. Given that the yarn contains 15% possum down, I’d say this is pretty good value. It compares very favourably against other possum sock yarns in the market. I think it is safe to assume that Cozi will take its place as one of the ‘must haves’ in the stash of any hard-core sock knitter. Will I personally be knitting with this yarn again? You bet!! In fact, I was so anxious about using up the balls I received from Zealana, that I promptly ordered more online from Mynx! I am yet to see this yarn listed at any of my local yarn stores, but I doubt that will be the case for much longer. I can see much knitting of Cozi socks (and gloves, and hats) in my future! Categories: New Zealand yarn, Possum, Review, Sock yarn | Tags: Knitting, New Zealand yarn, possum yarn, review, socks, Wool, yarn, Zealana, Zealana Cozi | Permalink. In the same way as we sometimes crave fast food, this week I craved fast knitting. 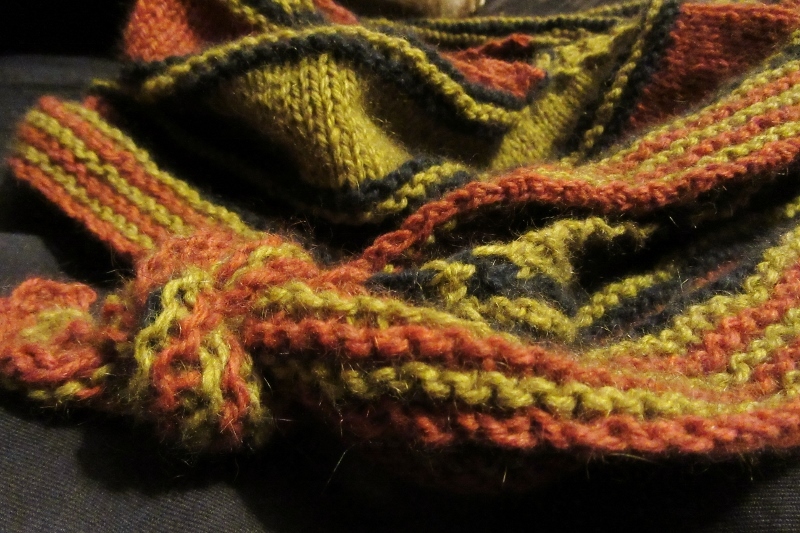 It probably had something to do with the fact that all my other projects are slow knitting – fine yarn or complex stitches – that require concentration and/or time. I could see no FO satisfaction coming my way for a couple of weeks. Nor was I always in the right state of alertness in the evenings to be able to cope with the concentration required. The yarn for Puck has been glaring accusing at me from the knitting table for quite some time, so I dived in and started knitting. It’s funny that I had all the recommended colours for Puck in my stash. It was a good way to use up those odd balls of Zealana Rimu DK that I had been collecting. I used Riverbank (just over one ball), and one ball each of Kiwicrush and Dark Napo (I think? – I have lost the ball band – it’s a navy blue). It is such a lovely yarn. This photo particularly captures the softness and drape of this New Zealand brushtail possum yarn. It’s a crescent-shaped scarf. I found that my cast-on edge could have been a bit looser. Next time, I will remember to follow the advice of other knitters who put in a YO after the second stitch (and then drop it on the return row) to add more give. Because this pattern requires you to make a stitch after the second stitch, I’d probably put the YO in the wrong side row which would have the bonus effect of giving me more yarn room to make the stitch on the right side row. Now that makes me want to go and knit another Puck just to prove my theory right! It is warm and soft and a nice pop of colour for my boring black work wardrobe. Thanks for the refreshing interlude, Puck! 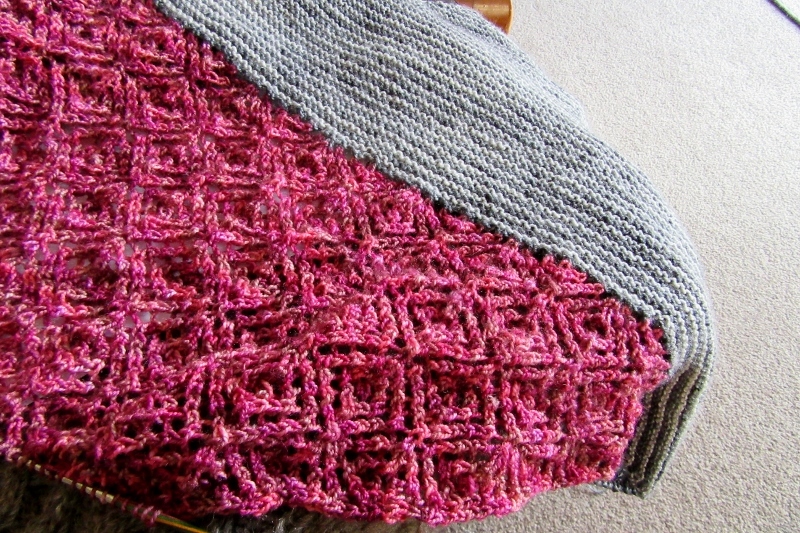 Fortunately, I have now finished the lace section of Lilli Pilli and am starting the next 100 rows of garter stripes. They’ll do for mindless knitting this week! 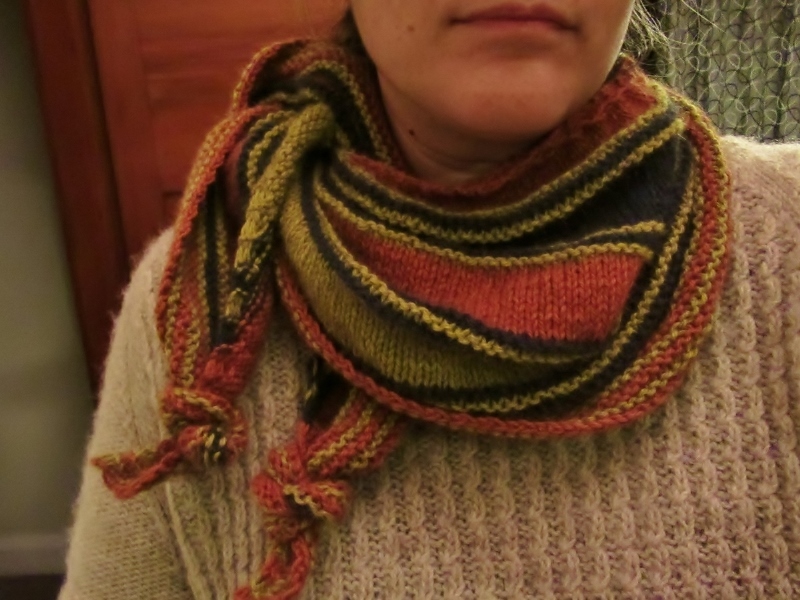 Categories: Finished Objects | Tags: FO, Knitting, possum yarn, scarf, Zealana | Permalink. Well, I started out this post about to write things like “nothing much on the radar” and “very little knitting”, and then I had a look at what I was going to show you, and I think that instead, a secret sock-a-palooza has been happening at my house. Right under my nose! And without me noticing! First off, I will show you the socks that were mostly knitted in one weekend. 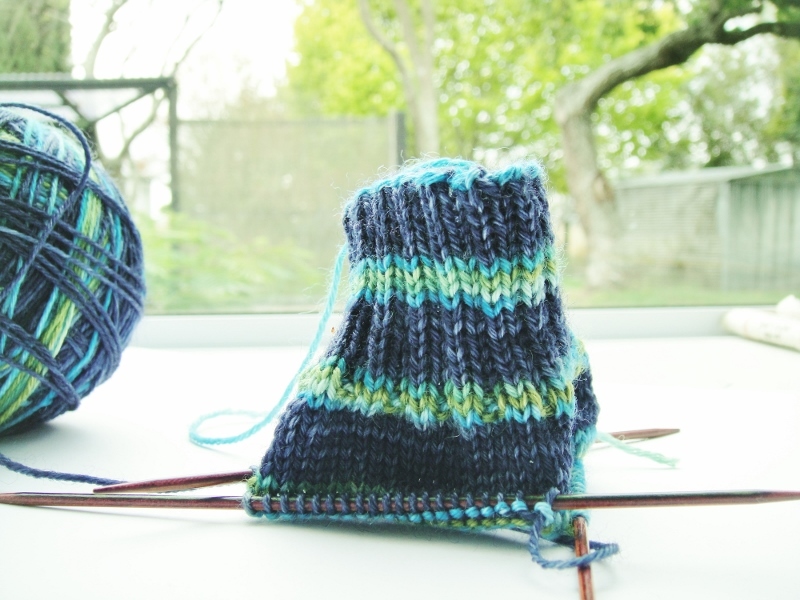 I started them during a birthday party that my son was attending, almost finished the heel by the time it was over (stockinette stitch and talking go very well together) and then finished it off at home. The next sock took a few more days to finish. This is an Opal Smile colourway. Sometimes a plain vanilla sock is what you need. Especially when everything else you are knitting ends up getting ripped and reknit several times over. which has become my bedtime knitting, but again, has been ripped back to the base because sleepy heads and lace knitting do not go hand in hand (although it does help with getting back to sleep when you wake up in the middle of the night and can’t sleep). And now I think you can see why I said nothing much has been happening, but at the same time, I find myself suddenly with a basket full of socks! This lovely self-striping yarn is the work of Doe Arnot, who has developed a colourway range inspired by a recent trip to Wellington. This one is called “Harbour”. I can definitely see the nautical theme! I can’t wait to see what else she loads up on to her site! I suspect it’s going to be first off the needles because my brain is clearly not able to focus on much else other than plain vanilla knitting at the moment. He’s wonderful to both drive and knit to (not at the same time of course). It’s music that doesn’t let you fall asleep! Categories: Socks | Tags: Claire Ellen, Doe Arnot, FO, Knitting, Robin, socks, WIPs, Zealana | Permalink.